Writer Beware is taking time off for the holidays. Unless there's some especially major publishing news, look for us to be back after January 1. Victoria will still be answering email. Contact her at beware [at] sfwa.org. 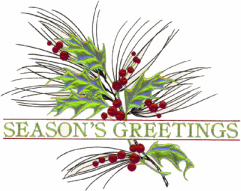 We wish all our readers peace, happiness, and excellent writing. Thanks so much for being here, for reading and commenting and sharing your experiences and spreading the word. So...if you're a regular reader of this blog, you know I love the crazy stuff, the little nuggets of publishing weirdness that I run across from time to time. Like author reality shows. Or bidding for a literary agent. Or trying to auction your story idea on eBay for millions of dollars. Or the tale of the "literary agent" who faked her own death and turned out to be a wanted criminal. So here's another snippet of weirdness for y'all. Introducing Quill Shift Literary Agency ("Re-imagining the role of the literary agency by creating an environment that finds and promotes great writers, invites readers to participate, and intrigues publishing houses to purchase those writers' works"). Founded by Ayanna Coleman, who claims publishing experience but provides no specifics (though she appears at one point to have worked for Serendipity Literary Agency), the premise of Quill Shift is a bizarre mashup of crowdsourcing (represented mss. are posted on the agency's website for "shifters" to read and judge), crowdfunding ("shifters" can "donate money to see it become a physical book"), and purported market testing (if a ms. achieves its financial goal "showing that the market will support it", it's then submitted to publishers). All, need I say, completely irrelevant to the process of marketing books to publishers. Where to even start with this? A bunch of random people reading manuscript excerpts online and maybe donating money a) isn't an "online community," and b) doesn't demonstrate market support. I seriously doubt that publishers will be impressed. Nor is this a workable concept in the long term, unless you're constantly refreshing your pool of readers. How many times will the same readers want to throw money at manuscript excerpts? Also, crowdfunding your business is not a business plan. Assuming your campaign is successful, there's not a lot of risk to you, since you're going to be playing with Other People's Money, but if things don't work out it will be bad news for your guinea pigs--sorry, I mean your clients. And what if your campaign isn't successful? What's your Plan B? Do you even have one? There's also a potential conflict of interest here. Quill Shift clients' manuscripts are also crowdfunded, with readers viewing excerpts and donating to a month-long "pre-publication platform and buzz creation" campaign. According to Quill Shift's FAQ, proceeds are split 50/50 between author and agency. Since this is money in hand--as opposed to the uncertainties of publisher submission--how tempting will it be for the agency to extend "buzz creation," rather than promptly sending out the manuscript? Of course, that pre-supposes that readers will actually donate, which I think is by no means a foregone conclusion. And what about the unfortunate authors whose "buzz creation" campaign doesn't reach its goal? After all the excitement of getting "the offer," do they get kicked to the curb? I don't doubt that Quill Shift's founder is well-intentioned. But she's clearly inhabiting that strange alternate reality that drives so many people on the fringes of publishing to try and re-invent the wheel. Sure, there are problems in the publishing biz, but a crowdsourced crowdfunded literary agency is not a solution. It's a hamster wheel for writers. Quill Shift's IndieGoGo campaign goal is $15,000. Amazingly, people are donating--$2,356 so far, with 17 days to go. Since, unlike Kickstarter, IndieGoGo campaigns get their money whether the campaigns are successful or not, donors will be on the hook for this crazy scheme no matter what. My name is Michael Capobianco. Some of you may know who I am. I was President of Science Fiction and Fantasy Writers of America for thee terms, 1996, 1997, and 2007. I’ve also served SFWA in a number of other capacities, including VP, Treasurer, and, currently, as one of SFWA’s representatives to the Authors Coalition of America. In addition, I’ve worked with other SFWAns to oppose the Google Books Settlement, write SFWA’s Orphan Works white papers, and worked on various other copyright and contract related matters. I was married to Ann Crispin, and, while there’s no way I could replace her, with Victoria’s kind encouragement, I’ve decided to officially join Writer Beware. I’ve already written a few blog posts for WB, mostly about legal copyright matters, but I’ve also helped with the April 1st posts from time to time. The Google Broccoli Kitten Settlement was my idea, for example. My interests are somewhat more policy-oriented than WB tends to be, but WB has a very broad agenda, and I don’t believe I’ll be changing it much, if at all. My perspective is that of a non-lawyer author who is surrounded by technological and legal changes that call into question many of the ideas about copyright and authors’ rights that seemed to be fixed and immutable just a decade or two ago. This is a time of tremendous upheaval, but it is only the beginning of a transition to a place we can only dimly perceive. Some of the changes over the last years are very good for authors, but others are eroding the underlying principles of copyright, and, in my opinion, that does not bode well for the future. I remember attending the "Electronic Book '99: The Next Chapter," sponsored the National Institute of Standards and Technology in September 1999. (Interestingly, Harlan Ellison was the keynote speaker, and I don’t remember much of his speech except that it didn’t have much to do with the topic of the conference.) Back then, a majority of the players were most interested in selling their new DRM schemes to publishers, because publishers were extremely fearful of the prospect of books that anyone could copy and “share.” Many publishers still feel that way, but I don’t think anyone at that conference could have predicted what the Internet has become, how the ebook marketplace functions, and the enormous changes created by a single corporation, Amazon. I don’t believe we can accurately predict what these things will look like in another fourteen years. But I think that, as in any chaotic system, a push in the right direction at the right time can affect the outcome in profound ways. Topics I want to cover in future blog posts include the recent verdict in the Google Books case, why orphan works legislation needs to be tailored to the needs of authors, what to do in case your (small or medium-sized) publisher violates your contract, and some stuff about writers' organization such as SFWA. I’d like to beef up Writer Beware’s sections that are directed at what is currently being called “hybrid authors” – authors who had some success in the world of traditional publishing, but whose books are now mostly out of print and who have not been able to figure out how to self-publish, or have self-published but gotten nowhere. Since I am an explorer in that realm myself, I hope to bring some specificity to the discussion. And finally, I hope to act to some degree as one of WB’s faces, appearing at conventions and conferences to help spread the word about literary scammers of all stripes. I do understand that there are scammers and trolls out there who actively oppose Writer Beware, and I suspect I’m due for my share of the libel and innuendo. While I in no way want to engage in useless public diatribes with these people, I do intend to do something about them. So, Victoria and Rich, thanks for letting me come aboard, and I hope I can help fulfill the mission of Writer Beware. I look forward to hitting the ground running. If you've read my two previous posts about All Classic Books, you already know this story. If you haven't, here's the gist. Cheryl Lee Nunn of notorious vanity publisher American Book Publishing (one of Writer Beware's Thumbs Down publishers, also featured in an alert at Writer Beware) attempts to expand her author-fleecing operation with a network of bogus organizations and publishers. Outed on this blog, she cuts her losses and folds the scheme--but, eager to make money on the back end, she holds authors' rights for ransom, threatening to give their contracts to a "transfer agent" unless they pony up a buyout fee of $695. Authors with All Classic Books (the only one of the bogus publishers to issue contracts) have just received another email demanding even more money (all errors courtesy of the original). Per terms of our book contract with you we are in the process of exercising our option to assign your book contract to another book publisher effective December 4, 2013. The transfer agent that is working on our publishing company merge or sale and book contract assignments is The Names Company, a publishing industry business broker specialist. The Names Company will oversee that all our book contract obligations are performed on. For example books remain in print and production and royalties are paid by required contract dates so that we are in full and complete legal compliance. This to make sure that our book contracts remain legally binding to all parties. The Names Company will not however be providing a publisher staff to answer your book publishing and book selling questions and other book marketing assistance as we have provided you. They will only be responding about questions related to book contract company assignment or your book rights buyouts. It is important to be aware that just listing a book title for sale today with ten million other book titles that book sales almost always occur because of an author interview, book review or other author promotional activity. If the author is not professionally promoting their title effectively, then it is highly unlikely the author will earn any royalties during the period either with The Names Company or a subsequent publisher assignment. Instead we have been recommending and helping our authors doing buyouts upload their book files to Amazon's book publishing companies Creative Space (printed books) and Kindle Direct Publishing (e-books) for free. We have instructed The Names Company to continue our full book rights buyout offer with our permission and and files for authors to use our edited content and book covers. Only wired funds will be authorized for those authors doing buyouts after December 4, 2013 through The Names Company will be accepted from that point, instructions are below. Once fund wires are confirmed, The Names Company will provide authors their book content and cover files, letters of full rights return and authorization to use our editing and design. Then they will remove any current sales listings. Authors then can legally re publish their book titles with another publisher or self publish it. Warning- Beware of anyone giving false legal advice. We are aware that there has been some false information about us rumored by a fantasy fiction volunteer writer giving our authors bad legal advice that would actually cause them expensive legal damages if they followed it. She does not disclose that she is not an attorney while providing legal advice, and that she is not a professional or unbiased journalist. She is simply a writer we rejected for employment and a book publishing contract about a decade ago, seeking to damage us and our authors with a smear campaign and false information. * The Names Company isn't a publisher. It also doesn't exist. Have a look at its website. Is it me, or does it seem a little odd that there's zero information on the company or its staff? Or that the only properties shown "for sale" are Nunn's bogus companies? Or that Googling "The Names Company" brings up nothing? Or that, just a few weeks ago, its website looked like this? Not quite what you'd expect from a "a publishing industry business broker specialist" (if there were such a thing, which there isn't). The Names Company, in other words, is fake--a Nunn fiction in aid of her scheme to extract cash from her authors. * As of November 5, when I wrote my last post about All Classic Books, it had published only a handful of public domain titles. But when I checked today, I found that it has begun pushing out original titles, all with pub dates of November 20 and later (five days beyond its announced November 15 closing date). It looks as if Nunn is punishing writers who don't fall for her buyout demand by exercising the rights she holds, even though the publisher that contracted them is supposedly defunct. If your book is or becomes one of these, don't send money to Nunn. Instead, use that cash to seek legal advice on how to get the books taken down and your rights returned to you. (There's a Legal Resources page on the Writer Beware website that may help.) Draw your lawyer's attention to Paragraph 21 of your contract,which provides for automatic termination and return of rights "in the event of the Publisher’s insolvency, bankruptcy, or assignment of assets for the benefit of creditors." Cite the first email you received from "Rebecca Reese Winslow," which clearly states that All Classic is closing down because it's losing money--i.e., insolvent. * If you haven't guessed, the "fantasy fiction volunteer writer" mentioned in the final paragraph is me. Nunn has been telling that lie about me being a disgruntled would-be employee for years, ever since she trumped it up for a lawsuit she threatened Ann and me with in 2003 (we called her bluff and the suit was never filed). If I needed any further proof that "Rebecca Reese Winslow" is Cheryl Lee Nunn, that would do it.